That’s a (big) Load of Garbage. Life in a condo made garbage feel like such an easier task. Without bins to drag to the curb and the worry that I exceeded my allowance, walking down the corridor to dispose of my waste, seemed almost a luxury. The convenience of a tri-sorter chute was steps away. The added task of heading down to a lower floor for larger recyclable items was what required the most effort. Still a better option, particularly during the winter months. 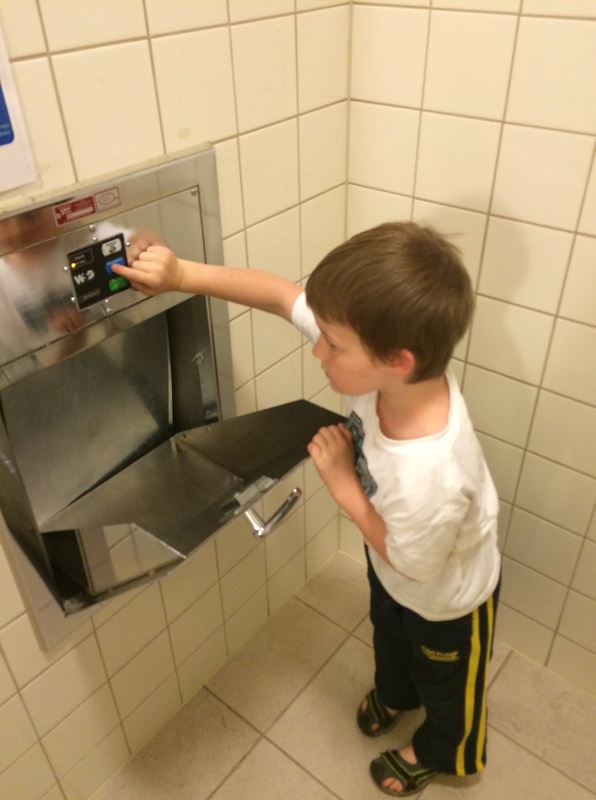 It also made the huge task an easier one, when everything was pint-sized. 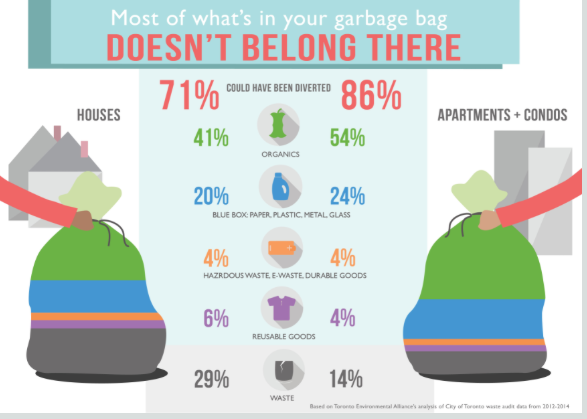 I personally felt I was doing a better job of ‘waste’ during my condo days. My husband felt the opposite. He felt that we did a better job at home. Did I mention his side job of garbage policing? So perhaps he caught the odd item or two that slipped into the garbage, when it should have gone elsewhere. I decided to do some homework. Mostly to educate myself, and partially to prove him wrong. Did I ever owe him an apology! I was shocked. Toronto’s high rise residents reportedly recycle at HALF the rate of single family homes. The current diversion projections for Toronto in 2014 are 68 per cent for single-family residential buildings, compared to only 30 per cent for multi-residential buildings. (Diversion rate is how recycling is measured and refers to the percentage of material that is reused and “diverted” from waste in landfills.) 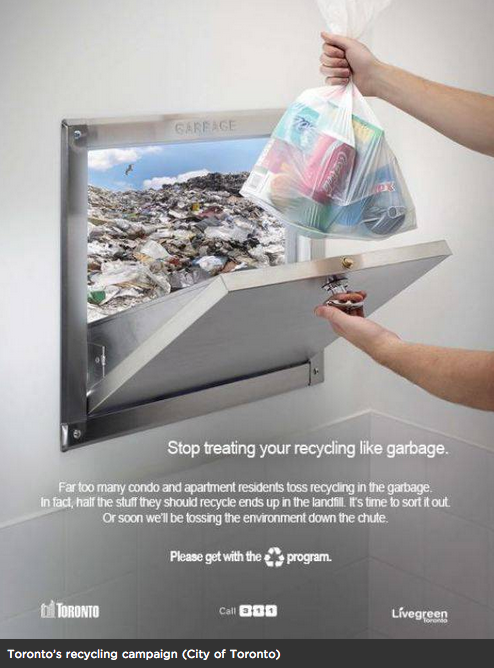 To be fair, Toronto (& its former municipalities) created the blue bin program 28 years ago, yet it took another 15 years to implement something similar into highrise buildings. Maybe there was a learning curve? Nonetheless, with such disparity you can see why the city deems this to be a problem, when over half of Torontonians live in multi residential buildings. So what’s the problem? We have new green LEED certified buildings. Tri-sorter chutes. Educated consumers.. How does this happen? Some attribute it to tangible issues such practicality, convenience and infrastructure.. It’s also suspected that the lack of individualism in a highrise building allows for a sense of anonymity and a lack of community ‘pressure’ to do the right thing. No see-through bag at the curb gives you a certain sense of freedom. Residents really are disconnected from their waste in this setting and let’s face it, recycling is a personal effort. It’s your trash. There’s also the fact that highrises may be more transient since people come and go often, and associated with that is the diversity of cultures that may not only result in language barriers but also in different beliefs on the importance of waste management. Like most new initiatives, change management is imperative. Solid Waste created an awareness campaign on the TTC to try to kick things off. There was also an Ambassador program created for residents to lead efforts in environmental efforts and sustainability. Education and awareness play the most critical part in anything you’re trying to change. For example, when we build a new condominium and use the most modern security technologies available for access control, it amounts to nothing if a resident is carelessly (yet well intentioned) holds the door open for a stranger close behind you, that turns out not to live in the building. This endeavour is no exception. There is a condominium in Scarborough with 283 suites and over 1000 residents that has demonstrated first hand the impact a solid implemented strategy can have, and has reached a diversion success rate of over 80%. The same as the ever infamous San Francisco rates. It went from spending $1500/month on waste collection to $150/month. Now, this is something that I think will catch people’s attention. There’s often a real challenge to show the cost savings of recycling. But what if people that live vertically started to see the savings from their recycling efforts passed on to them as a whole? It’s worth a try. As our skyline continues to stretch upward, we need to make more of an effort to address the environmental issues that accompany it, waste management being a significant one. After all… in the end, the cost of landfills being filled with waste that should be elsewhere, is something we will all pay the price for. And to my husband, I’m sorry. You were right.